The engine switch mode is recorded by the vehicle. If the battery is reconnected, the vehicle will return the engine switch mode to the status it was in before the battery was disconnected. Make sure to turn off the engine before disconnecting the battery. 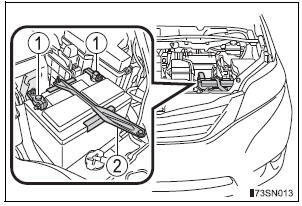 Take extra care when connecting the battery if the engine switch mode prior to discharge is unknown. Do not disconnect the battery while operating the AUTO ACCESS SEAT. The AUTO ACCESS SEAT will become inoperable. For details, refer to “AUTO ACCESS SEAT OWNER’S MANUAL”. If electrolyte gets on your clothes It can soak through clothing on to your skin. Immediately take off the clothing and follow the procedure above if necessary.